Walk through the All Star offices this July and August and you were immediately reminded that summer doesn’t last forever. Soon, school would be in session. After the Philanthropy Committee announced the latest charitable giving event—a school supply drive— donated notebooks, pencils, calculators, crayons and more quickly piled up. For our latest endeavor, we partnered with Mary’s Place. Established in 1999 as a complete resource center for homeless women, Mary’s Place now provides services to area women, children and families who are in need of a safe place to stay, two meals a day, medical care and support groups, among other types of aid. Mary’s Place hopes to eradicate homelessness by providing essentials and services to help adults apply for jobs and find housing. 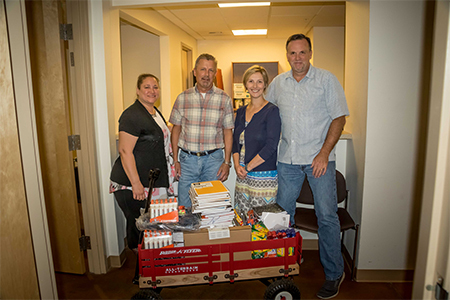 From July 15 to August 17, All Star collected school supply donations from employees. To keep things interesting, teams competed to see who could gather the most supplies. Maybe it was the friendly competition or the desire to help kids in need (or both), but donations quickly surpassed the goal of 800 items. In total, we collected more than 1,600 school supplies for the shelter. In addition to this, seven All Stars spent Aug. 31 at Mary’s Place where the organization held its back-to-school fair. Hundreds of children received a backpack stocked with school supplies and a new pair of shoes. School photos were also taken. The children were escorted by a volunteer personal shopper, including All Star CEO Bill Hummel, Executive Chairman Doug Brown, Systems Administrator Brandon Froehlich and Controller Michelle Ferris. With their help, kids were given a few minutes to choose a pair of shoes in their size. Senior Account Manager Courtney Crooks, HR and Finance Assistant Michael Eastberg and Content Marketing Manager Jen Jope manned the shoe table to help kids with their decisions. The day was also a time to socialize before heading back to class. The kids enjoyed ice cream, pizza and jumping inside a bouncy house.